Butter-and-eggs brightens the September scene around Westborough. The orange markings lead bees to the nectar deep inside the flowers. In mid-September, when the wildflowers in Westborough all seem to be asters or goldenrods, you may notice an exception: butter-and-eggs, a yellow and orange flower that looks like a snapdragon. 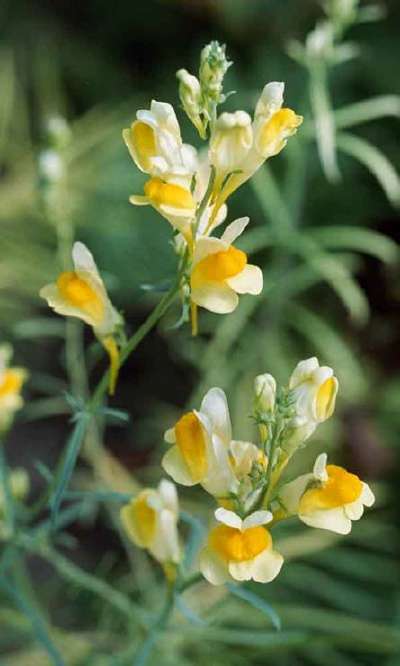 Butter-and-eggs (Linaria vulgaris) puts on its best show in late summer and early fall, although it can bloom from June through October. It looks like a snapdragon because it is indeed a member of the snapdragon family. This hardy plant with light green needle-like leaves thrives in dry, sunny, sandy spots but withstands the low temperatures of fall and spring. You're likely to see butter-and-eggs in dry fields at the Bowman Street Conservation area (near the entrance from the Bowman Street parking lot), the Headwaters Conservation Area, and the Westboro Wildlife Management Area. You may also notice it growing along a road or sidewalk. Check the lot on Main Street where the old post office building used to be. The yellow and orange colors of the blossom give butter-and-eggs its name, but their pattern also serves another purpose. The bright orange attracts bees and marks a path for them to follow to the nectar deep in the spur of the flower. Large bees such as bumblebees literally push their way into the flowers. Although the mouth-watering name might suggest something good to eat, butter-and-eggs is not a food plant. On the contrary, it has served as a fly poison, made by mixing its juice with milk. The flowers have also provided a yellow dye. Butter-and-eggs had a role in folk medicine of the past. A tea made from its leaves worked as a laxative and a diuretic. The plant has also been used to treat jaundice and skin ailments. Butter-and-eggs is partly parasitic so it needs to grow with grasses or other plants. Its roots tap into other plants' roots, taking some water and salts without killing the plants. Butter-and-eggs came here from Europe but has become naturalized throughout much of North America. It spreads easily, both by seed and underground runners, and it can form large colonies. A few states consider it a noxious weed.